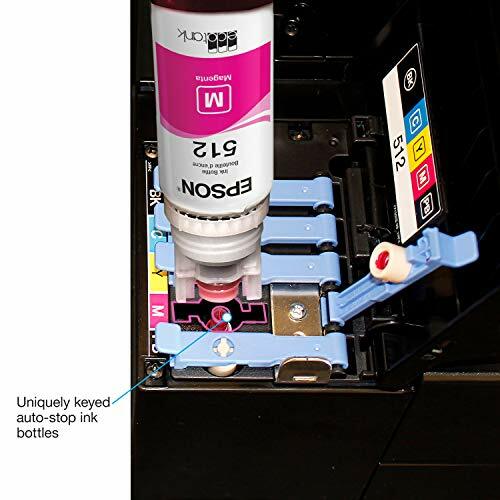 ON THE FACE of it, the ET-7750 is the perfect candidate for Epson’s EcoTank system, which shuns cartridges in favour of refillable ink tanks. 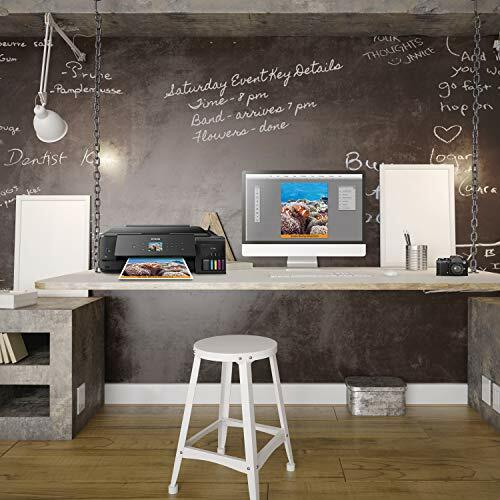 Photo printing is a notorious drain on ink, and an A3+ capable photo multifunction peripheral (MFP) even more so. 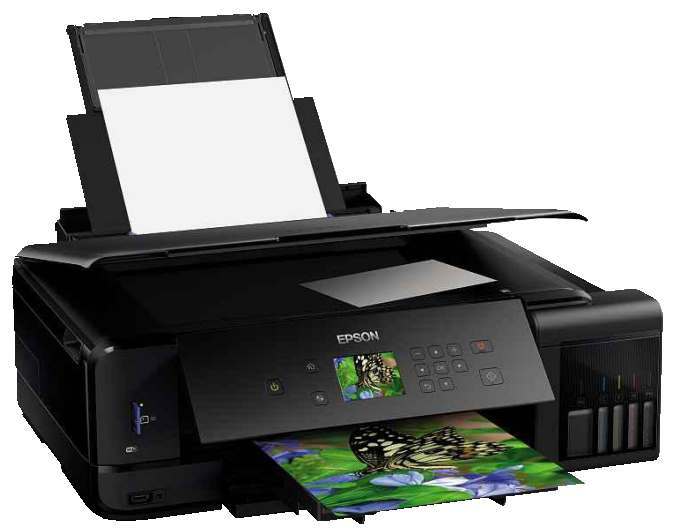 Read our EPSON EcoTank ET-7750 Review. 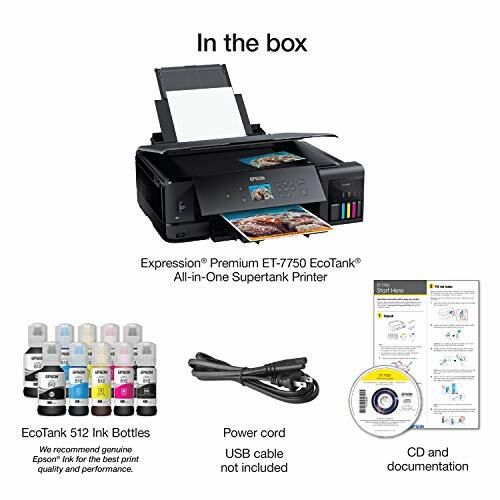 Thanks to EcoTank, the ET-7750 arrives with enough ink for a claimed 3,400 6x4in prints, and after you’ve printed those, the extra bottles work out at about 3p per photo. If you only consider purchase price, the ET-7750 has a slightly disappointing specification. It’s certainly not bad: there’s support for wired and wireless networks, A4 scans and copies, and automatic double-sided (duplex) prints. You can make borderless A3+ photo prints, and either scan to or print photos from an inserted USB stick or SD card. Look at the details, however, and you’ll notice a maximum scan resolution of just 1,200×2,400 dots per inch (dpi). Furthermore, where many five- and six-ink printers use their extra colours to extend the gamut, reduce grain or improve black-and-white images, the ET-7750 creates photos with just four colours: its fifth tank contains a pigment black ink for plain paper work. Happily, that helps make the ET-7750 a good all-rounder, which can turn out fairly bold and crisp black text at nearly 15 pages per minute (ppm). Colour graphics weren’t quite the punchiest we’ve seen, but they were sharper and more solid than from many general- purpose inkjets, and at 5.5ppm they appeared quickly, too. Mono and colour photocopies popped out at 12 and 22 seconds respectively, and their quality was also very good. Using just four colours, the ET-7750 was never going to produce the best photo prints, but we were pleasantly surprised by what it could do. Our black-and-white test shot was free of any obvious colour cast, and exhibited great detailing in all but its darkest regions. Colour prints were similarly impressive, with deep, resonant, yet accurate shades. While not the sharpest we’ve seen, photos were well detailed and, to the naked eye, free of grain or other artefacts. It’s a shame the ET-7750 can’t scan above 1,200dpi or output 48-bit colour, but in all other respects its scan performance is impressive. Scans were sharp, with accurate colours and detailing: the ET-7750 could distinguish every shade on our Q60 target. Tested over wired Ethernet, speeds ranged from 10 seconds for a preview, to 47 seconds to capture a 6x4in photo at 1,200dpi. rapid all-rounder, capable of delivering solid general-purpose prints, scans and copies. While not an exceptional photo MFP, it’s more than capable enough for most casual and amateur users. And while the ET-7750 seems expensive, its low running costs make up for it, provided it’s reasonably well used. However, that last point reveals a potential fly in the ointment. 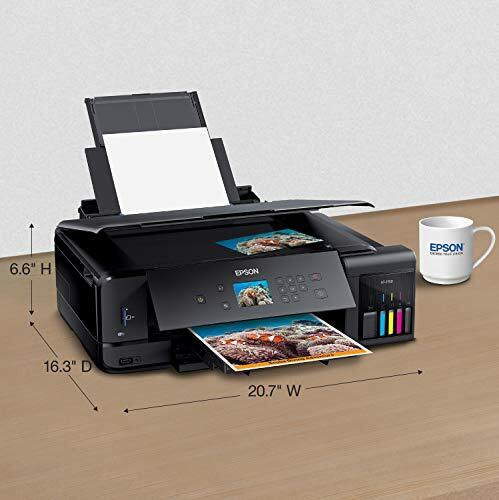 It can take more than a year’s use for an EcoTank printer to become better value than its cartridge-quaffing equivalent, but here Epson provides only a measly one-year warranty. 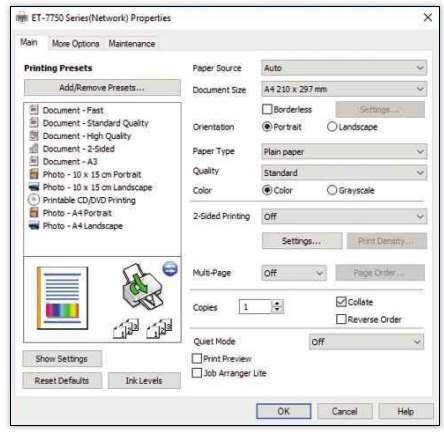 If your ET-7750 should fail after 12 months, but before you’ve printed enough for its low running costs to offset the high purchase price, you could be out of pocket. 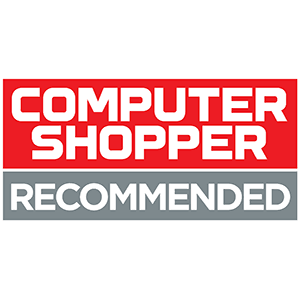 We don’t have any doubts about this printer’s reliability, but as a precaution we’d recommend buying from a retailer that offers a warranty extension. 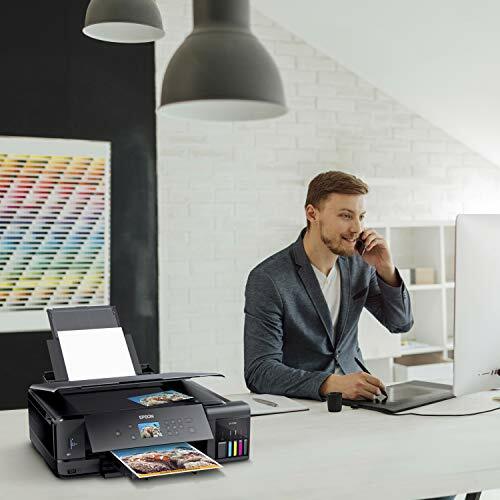 The Epson Expression Premium ET-7750 produces exceptional output at very low running costs, making it a terrific value if you use it often enough to justify its purchase price. 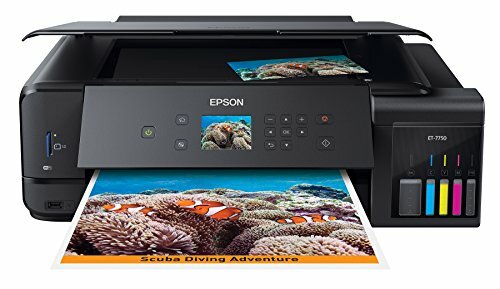 Epson’s EcoTank system may look a little clunky and it certainly adds cost, but in terms of print quality and ink economy, the ET-7750 is hard to beat. 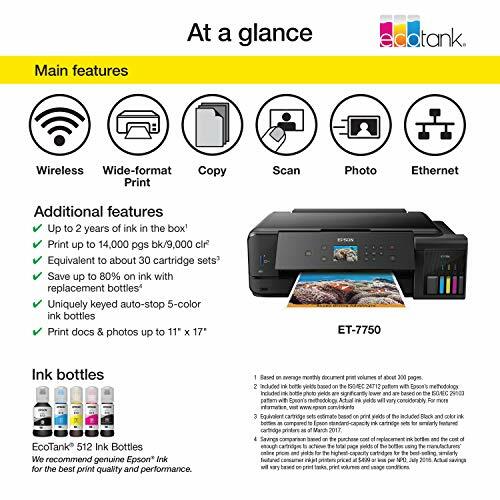 Quick and capable, the EcoTank ET-7750 is a great MFP for busy amateur snappers. 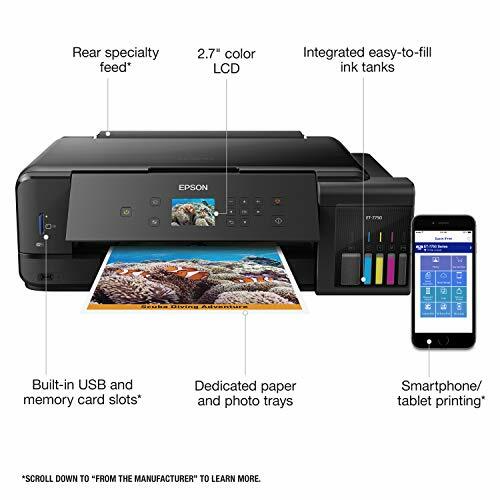 Includes enough ink to print documents up to 14,000 pages black/9,000 color (3) - equivalent to about 30 ink cartridge sets (2).